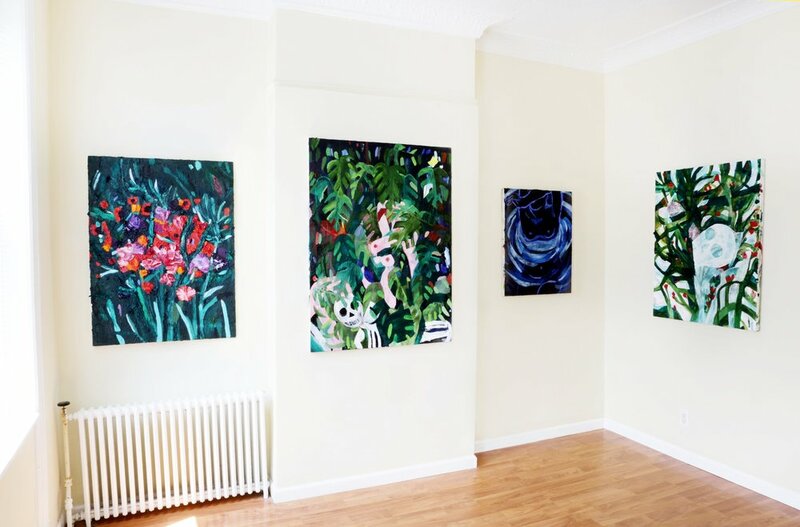 Emilia Olsen’s premier solo show in New York City is featured at the apartment gallery Doppelgänger Projects in Ridgewood, Queens. 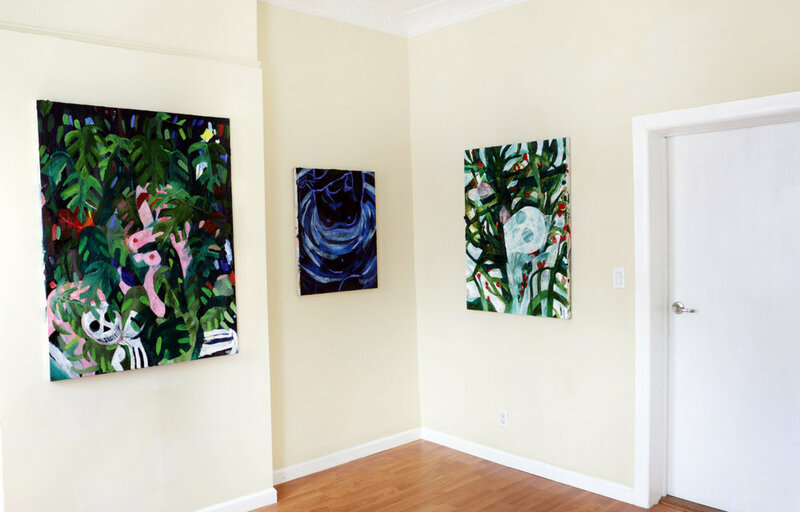 Upon entering the gallery, Olsen’s work provides vivid contrast to the pale yellow walls, peacefully luminous in the natural light spilling from the windows that light the main room of the space. 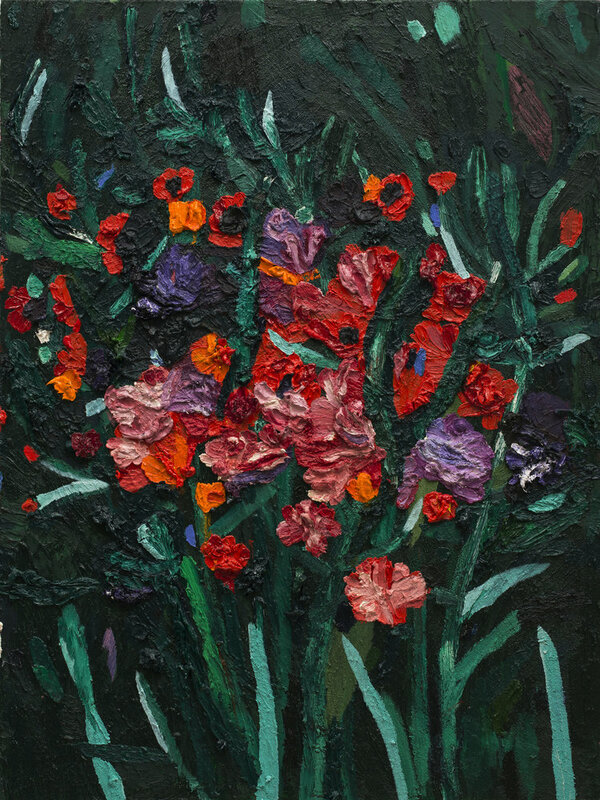 There are thirteen paintings in the show, all of which are brand new, except for two Untitled works from 2017. The paintings function as mysterious portraits of the artist, and provide a mirror through which to see our own longing and mortality. A bleached-white skull appears often—sometimes grinning and always vaguely ominous—both a talisman and uninvited ghost. Viewers interact directly with the face of death, while the maiden plunges ever deeper into the lush heart of the jungle, appearing only more fully in the scorched desert, as she shields herself from view or crouches in the haven of a cactus patch. The paintings are luscious, with unabashedly applied oils that undulate and mound like painted lichen. 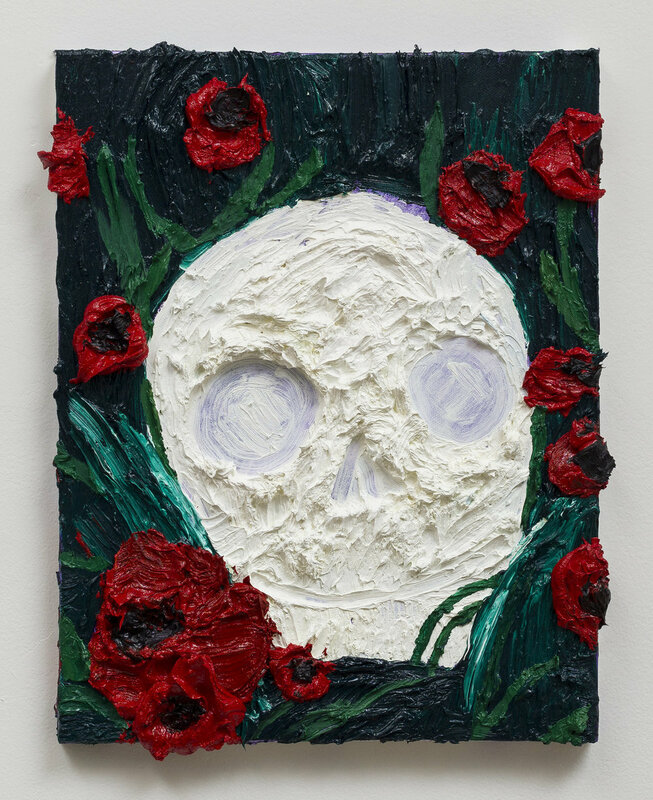 In Poppies, the ghoulish portrait of the skull recalls pure white frosting on a cake, eyes and features scraped from its face, almost clean to the canvas below, and nestled in a bed of crimson blossoms. In the flora paintings, the vibrant greens of the plants complement the masked body of the maiden, with a backdrop of dark undergrowth within which she escapes from view. In New Mexico, the girl disappears, but the burst of fiery red and purple flowers takes her place. The forest scenes are permeated by four blue canvases that feel more like dreams, with swirling ripples of water or tangled sheets snarling the figure as she bathes or sleeps. In the small painting Us, the heroine clutches the skull in a passionate embrace, hiding her expression as the bony face grins. The exhibition gorgeously intertwines a tangible melancholy with a substantive desire to decipher the psyche, in all its entangled and beautiful mess, offering tender meditations on the delicate uncertainties and trials of the human on earth.